BC Lions centre Angus Reid has teamed up with teammate Andrew Harris to raise money for the Boys and Girls Club. Reid runs a t-shirt screening business and has used his artistic talent to create a caricature t-shirt of the Lions star running back. 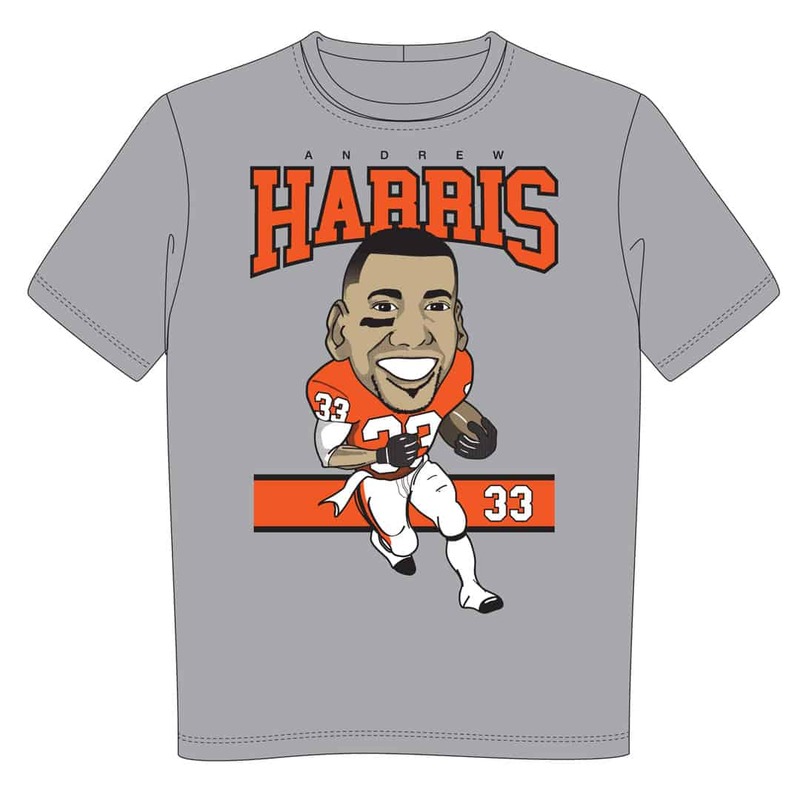 The shirts come in sizes from small to XXL and you can order them directly from Andrew’s web site, Harris33.com. They are $25.00 each and $10.00 extra if you would like them shipped, anywhere in Canada. Angus asked me to see if any of our blog readers, local fans and tailgaters would be interested to pre-order and be able to pick them up from at the Western Final tailgate party. This way you’ll have them for the game and you’ll save $10.00 on shipping. Leave a comment below with your order, clearly stating size. You must pay for and pick up your shirt at the Western Final tailgate. I will not have extras for sale, only what was pre-ordered. Ladies, if you would like a women’s cut shirt you must post your order by Monday afternoon! All proceeds from the shirts will go to the Boys and Girls Club charity.